Morgan assumes the couple in the boathouse is Kiki and Dillon. He angrily stabs a large fishing hook into the door before storming off. Turns out it was Ned and Olivia (I called it!) hooking up. Griffin and Anna discuss how horrible it is that Julian is free. They complain there&apos;s no justice for Duke, which is great because I hadn&apos;t heard that conversation before. Griffin feels hatred that he doesn&apos;t know how to deal with. Julian lets himself into Alexis&apos; house because she&apos;s been too drunk to change the locks or install a security system. He claims he&apos;s there to pick up a box of stuff. Anna arrives as he&apos;s leaving. Alexis knows why Anna is there and says she has no explanation for what happened at the courthouse. Anna complains that Julian will never pay and Alexis agrees. Anna points out that Julian violated the restraining order by showing up. 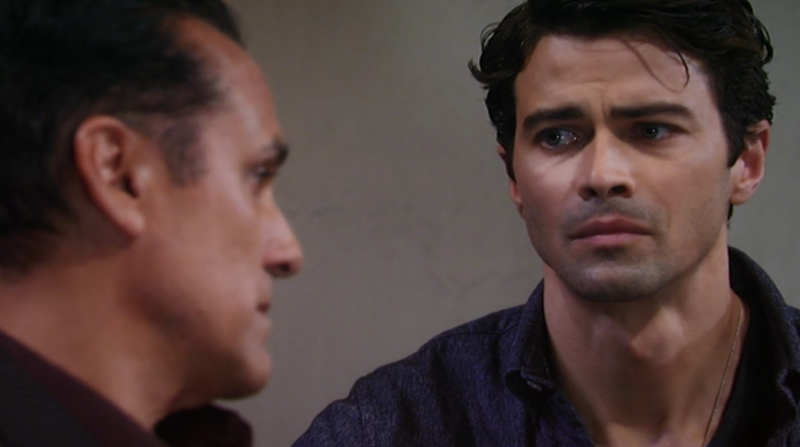 Alexis wonders if Sonny will go after Julian. Anna says she stopped him once, and she won&apos;t again. Sonny heads over to church to explain to God how he&apos;s planning on taking out Julian. Griffin shows up to look for guidance. He wonders what Sonny wants from God. Sonny claims God know what he does. Sonny wants justice, but Griffin questions why Sonny feels it&apos;s his right. Sonny says he has the resources and that Julian will be coming after those he loves. Sonny feels he can&apos;t sit on his hands and has to do the dirty work. Griffin feels God has his reasons for everything and he thinks Sonny doesn&apos;t believe in God at all. Kiki takes Dillon to work so that he can get his mind off of his father. Kiki tries to reassure him that he&apos;s not responsible for anything Paul did and that she understands his position. The two kiss. Olivia notices the hook in the door. She thinks that it&apos;s from Julian because he found out she was seeing Ned and is threatening them. Olivia and Ned confront Julian, who denies knowing anything about the hook. Ned decides Dillon did it to vent about Paul. Morgan runs into Nelle at the Rib and decides to unburden to her. He tells her that Kiki cheated on him then complains about his medication and how he can&apos;t be normal. Nelle points out that she also needs to take medication because of the transplant. Morgan decides the two are alike and kisses her. Nelle breaks it off and storms off. Morgan chooses not to take his medications.